The house was great, the view was amazing, and the manager was great. There were only little things I noticed that I would have changed like I did not sit in the dining room chairs because they were not sturdy enough and I didn't want to brake them. Bring your own cooking pans the ones they have are not that good and didn't have a large pot to make pasta in or homemade soup. Also the dishes were dirty and had to be washed before use, I'm guessing this is because the have the previous guests wash the dishes and they are used to having a dishwasher to finish the job for them. The driveway could use a little work it is a bit rough and the bushes on it need trimed was rubbing up against my husband's truck. Also the house could benefit from a deep cleaning I noticed along the edges of the rooms and corners it had not been scrubed lately and the dusty dried eucalyptus in the corner was a bit gross and would be bad to have around for someone who is allergic to it. Also the shower has a little bit of soap scrum build up so that would benefit from a good scrub. But over all it was clean and the bed was nice with nice clean sheets. The soking tub was amazing the hot tub was amazing and there were little wild rabbits in the morning and evening in the backyard. Overall we had a great stay and would stay again maybe with some friends next time. It's hard to find good places to stay with so much privacy and that is a big win to us. Hello and thank you for your feedback! We are very happy to hear you enjoyed your stay :) We are sorry about some of the cleanliness issues as that is a very high priority for us! Yes the dishes are washed by guests and we try to catch it if they don't do a good enough job, so I'm sorry it wasn't caught. We will pass on the kitchen feedback to the owner. We will also work immediately on those deeper cleaning items. We are so happy you enjoyed the hot tub and soaking tub. The hot tub was just replaced with a brand new tub just before your stay :) Thank you and we hope you can return and stay with us again! It was a great place. The only downfall was the fridge. They need to replace the dorm room size fridge with a regular full size fridge. Thank you for you comments. We are happy you stayed at a "great place" on Whidbey Island. 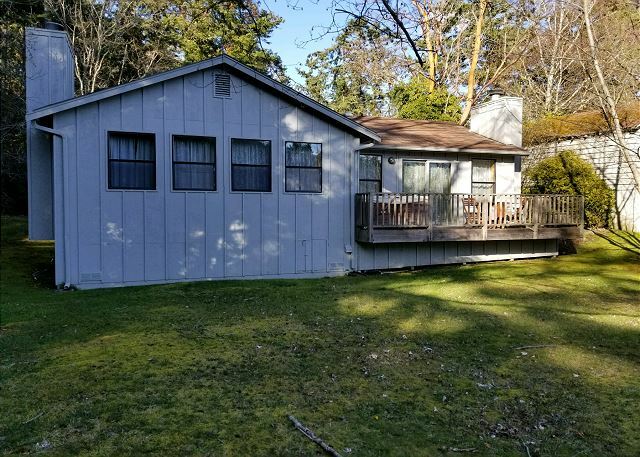 We will pass along your comments to the owner of the property. We hope we can help you with your next stay on the Island. This little cottage provided us with a good amount of space for a week while we were dealing with family responsibilities. 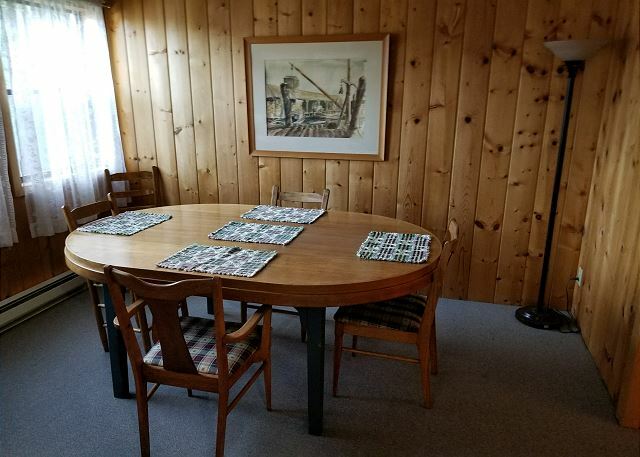 The cottage is strangely laid out. 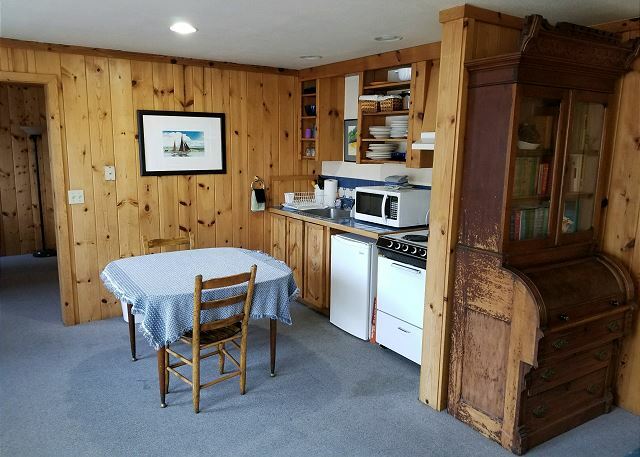 The kitchen is tiny with limited counter space (mostly covered with a large microwave) and a really tiny refrigerator (dorm size) To make the kitchen usable, bring the table in from the deck and move the microwave to it. There is a table in the kitchen where we ate and used for extra food preparation space. 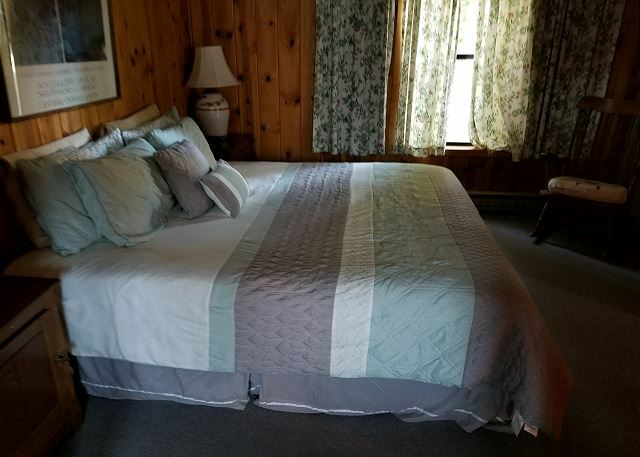 Otherwise, there is a small living room area, two very generous sized bedrooms, on small bathroom, and what would be a very useful sitting/work room off the master bedroom, except that it has a hot tub sitting right in the middle of it! This is in addition to the very nice hot tub on the deck. The master bed mattress is in fairly good shape, except that it needs a topper to moderate the firmness a bit. The cleaning crew prepping the cottage for us left a note warning about a minor leak in the kitchen sink faucet. Tara Property Management did not get a plumber out to check it for almost a week. It could not be repaired and had not been replaced yet when we left. Tara Properties also needs to rearrange their getting into the property instructions. The bottom key lock needs to unlocked BEFORE you try to make the somewhat weird pushbutton lock work. Once we finally got it to work (including a code number change), we just depended on the key lock. The cottage would have a good view of the lagoon IF someone would bother to trim the brush that blocks the view from the cottage. Thank you for your review and suggestions! We will go over these with the owner! Thank you for your comments. We are happy you had and "enjoyable" stay on Whidbey Island. 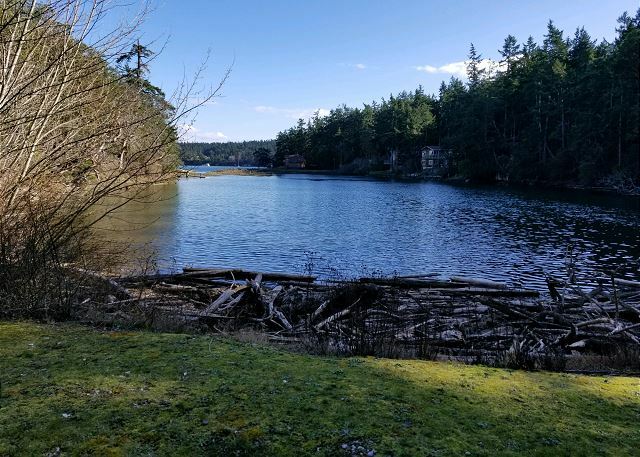 We hope to help you with your next vacation on Whidbey Island. Overall we had a nice time. 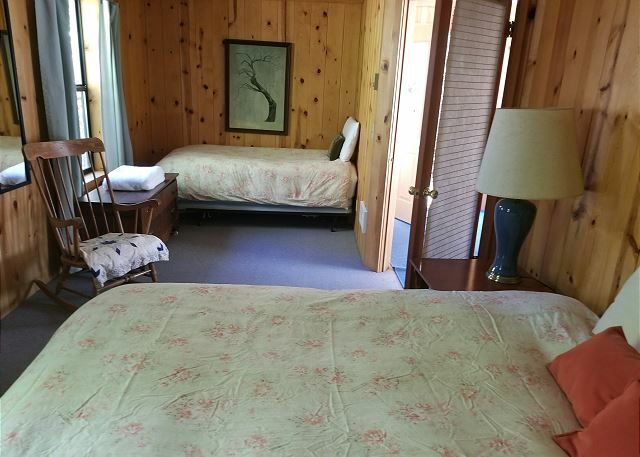 The cabin is very private and quiet with a nice view of a lagoon. There was plenty of room and the fireplace was nice! However there is a very large but. Neither of us were at all happy that the landscaper started working at 8am. We were ASLEEP. We chose this location because it was quiet and private. It was not pleasant in any way to wake up to someone walking by our open window blasting weed eaters, blowers and lawnmowers. Our last chance for some quiet relaxing time before we had to checkout was gone. We discovered after he left that our car was covered in lawn debris and leaves. Lesson learned, inquire about landscaper schedule when renting. Thank you for your review. We are very sorry this happened. Most of our gardeners check to see if there guests staying in a home before they start. We will definately check with the gardener that takes care of this home. 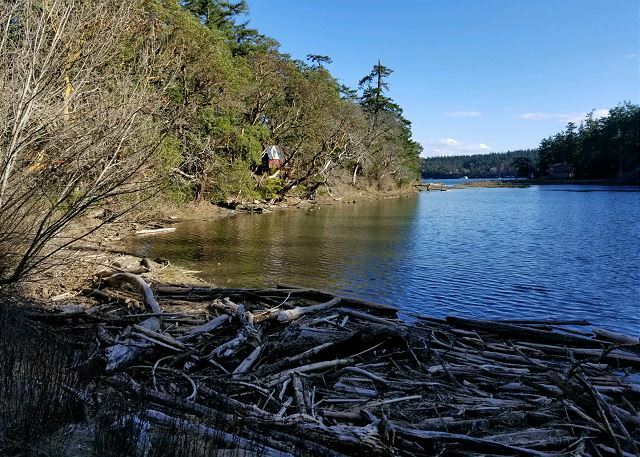 We are glad you enjoyed your stay on Whidbey Island. 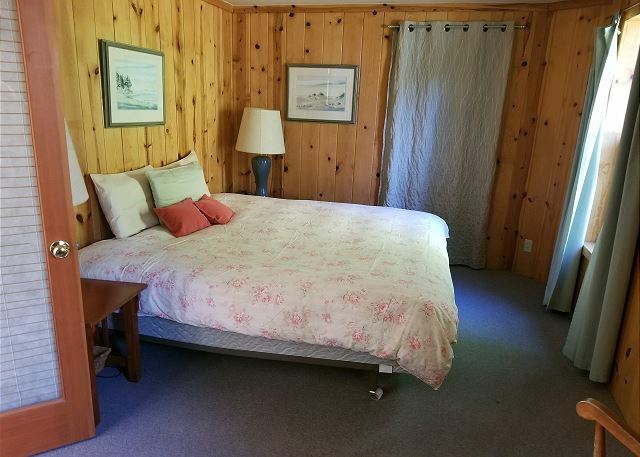 Cute cabin,very clean,comfy beds.private. Very good experience. Right next to fine dining with a beautiful view of the water. Picture does not do it justice.Very good customer service. Thanks for your review! We are so glad that you enjoyed your stay. Great experience, from payment through departure. Cute and cozy. Liked the location of the property, but a few things need improving for us to come back. First thing would be new mattresses. The beds were terribly hard, we could hardly sleep no matter how relaxed we got in the hot tub. Second thing would be signage on the house. We got there before dark, couldn't figure out which house it was, and the road is very narrow and hard to turn around on. House needs either a clear number or a sign with a name, or notes in the instructions that it is the very first driveway on the right. On a smaller note, there was a tv and cable box but it would not turn on, kept saying please wait for this signal or something like that. I don't care if there is a tv, but if it is there it should work. Did not attempt to cook there once we saw how small the kitchen was and there was no dishwasher. 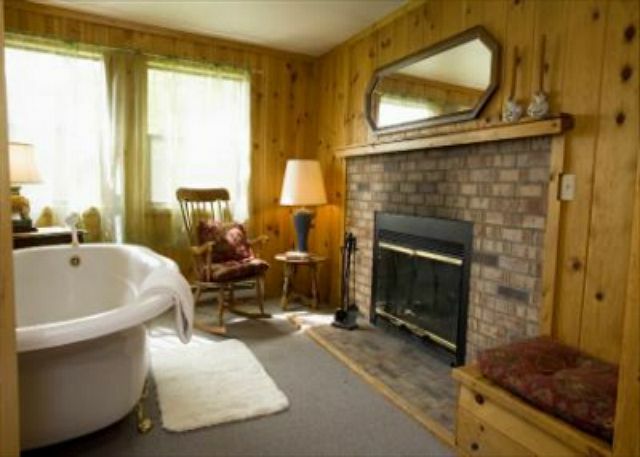 Loved the hot tub and the fireplaces and the general location. This is a very cozy cottage. Wonderful area. It was fabulous! There were a few things on the house I would change. Definitely need a bigger trash can that the raccoons can't get into, they made a mess daily. Bigger fridge! The management was wonderful, a couple things we had questions on or needed they were on it immediately. The cottage is older with 1 bathroom so there was a line forming for showers but we knew that so no problem. LOVE Coupeville! 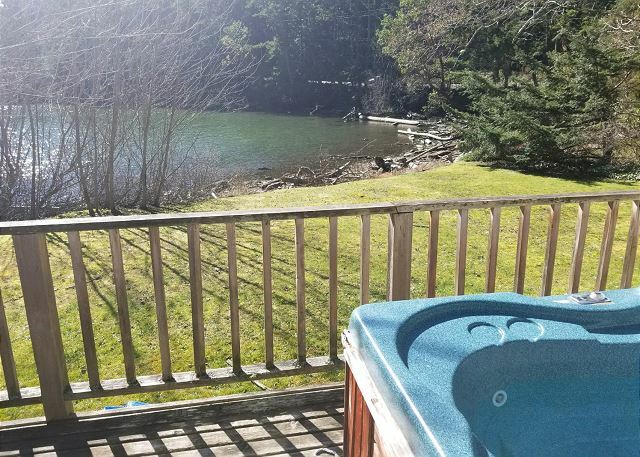 Located on a nice lagoon, overlooking the eastern side of Whidbey, near Coupeville, this quaint little cabin is a nice little get away for 2-4 people. Ran into a couple of issues, but management was helpful. Having realistic expectations, we were happy and made the most of it. I did not give this property 5 stars mainly because we paid $45 for a hot tub maintenance fee, but the hot tub was broken when we got there! 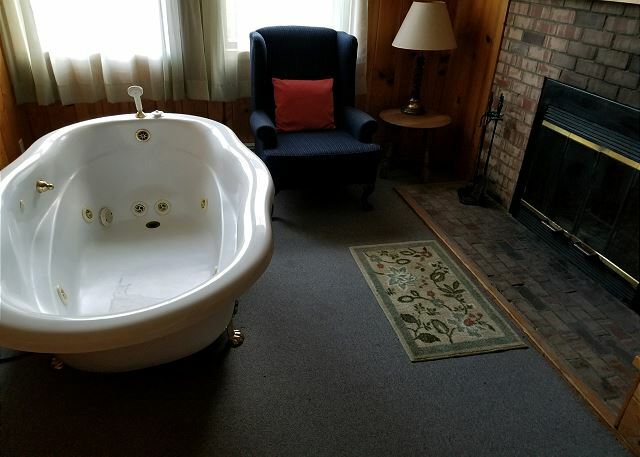 We were quite disappointed, as we'd been looking forward to it; and couldn't understand why a place would charge a hot tub fee and yet not use that money to make sure the hot tub was actually functioning properly! Also, the jetted bathtub would have been nice if there was enough hot water to fill it and make it HOT (the hot water tank didn't seem to be able to be adequate). Still, we enjoyed our stay, it was very relaxing and peaceful and private! 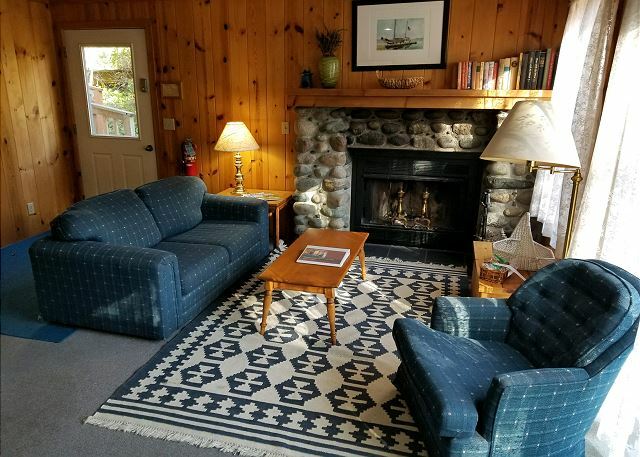 The home was very spacious and we loved the wood fireplaces and the custom wood decor throughout the place! It made our time so homey and cozy. All in all, we might come back here with our daughters, but probably will look for another place nearby to rent for the two of us. On another note, the property manager, Karen, was very apologetic and friendly and tried to be as helpful as possible, so we were thankful for the service. She even refunded some of our money b/c of the inconveniences. Thanks, Karen! 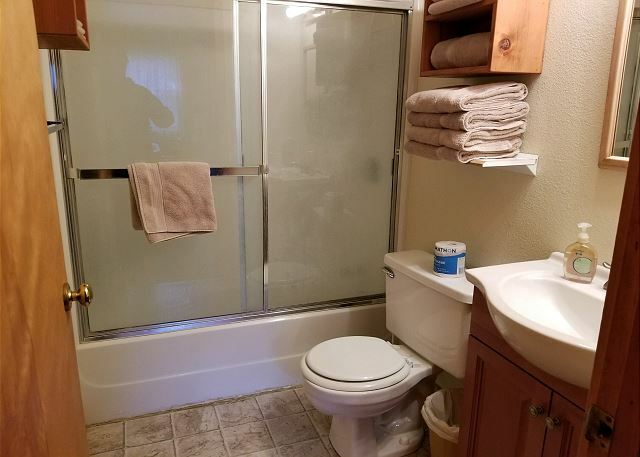 As a property manager, it is always an awful feeling when a renter checks in and something is not funtioning properly. This hot tub was treated and inspected only 2 days prior to this guest check in, as we standardly do before a guest checks in. At that time is was functioning property. Unfortunately, the hot tub stopped working prior to the guest checking in without us knowing. 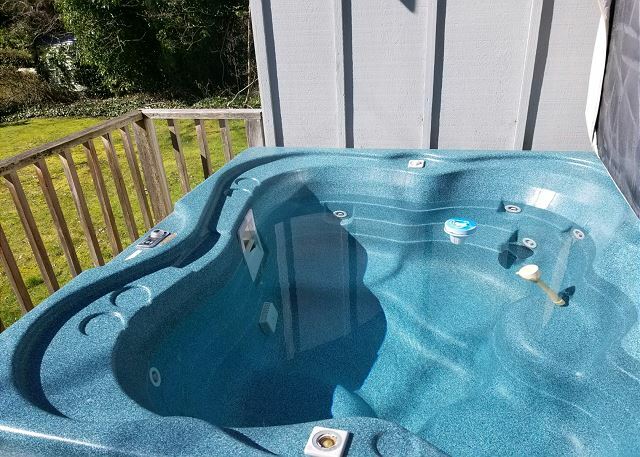 We quickly offered a full refund on the hot tub fee, plus a little extra discount on the rent in order to compensate the renter for the inconvenience. Our apology to the renter that they were not able to enjoy the hot tub. These renters were very kind and patient, and we really appreciated that. We look forward to being able to serve them again sometime. We also have not ever heard that the hot water tank is not sufficient to fill the bathtub, and we will be checking into that immediately. Thank you! I was in contact with the management company before we confirmed our rental because of negative reviews I had found. Wow, were they wrong! The company was very professional, prompt and helpful with all questions. The cabin was exactly what we had wanted and expected. It was very clean and had everything we needed. The hot tub was clean and worked well. Very private setting, so we were able to use the yard area also. The ocean water off the yard is not really swim-able, but beautiful - especially over morning breakfast on the patio. Im glad I didn't listen to the negative reviews that were expecting the Hilton! 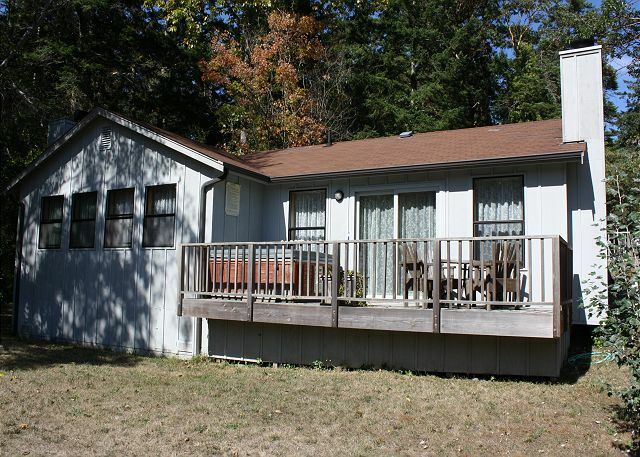 It's not a luxury cabin - but perfect for a quiet getaway. As a local, was able to find the property in an hour our so, actual loction not available until after contract is signed, but address given was not address of the property. No directions to the location. It would have been nice to know how small the refrigerator was before coming up. We brought groceries for the week and ran out of space for them. I also would have liked a recycle bin available, at least for basics like glass. Otherwise, I thought it was a terrific cottage, nicely located, with a great view. Everyone I spoke with from the office was very pleasant and helpful. I will definitely come back.